What is a Vermont Eviction Notice? Vermont Eviction Notice: What Is It? A Vermont eviction notice is a written document created by the landlord or their authorized agent (such as a property manager or property management company). The purpose of the notice is to inform the tenant of the rental property that they’ve violated the rental agreement or lease in some way and that they have a certain amount of time to either comply with the agreement or vacate the property. Better known as a notice to quit, all Vermont eviction notices must comply with the state’s landlord-tenant laws. What Are the Components of a Vermont Eviction Notice? The name of the eviction notice. This is an important component because it provides the reason for the eviction and how long the tenant has comply in it. The name of every tenant who signed the rental agreement because they all agreed to uphold the terms of the lease. If you’re evicting a roommate, you would list only the roommate that is being evicted. The full address of the rental property. This includes any street or building number, street or road name, unit or lot number (if applicable), city or town, and the county where the rental is located. A detailed reason for the eviction. The deadline by which the named tenant must comply and / or vacate the property (not all eviction notices give tenants the option to comply; some request that the tenant vacate the property). The amount of time given depends on the eviction notice. You’ll learn more about that soon. The signature of the landlord or the agent who issued the eviction notice. You’ll also want to create a Certificate of Service that documents the service process. It lists the date service happened, on whom service was performed, how service was completed, and the signature of the server. Before we talk about the most common Vermont eviction notices, let’s talk about the service process because it is imperative that eviction notices are legally served. If the notice isn’t legally served, the tenant may not need to comply with it and you may not be able to sue them for non-compliance. Service must be performed by serving the tenant in person, via certified mail with return receipt requested, or with first-class mail. A return receipt will act as proof of service for court as would the Certificate of Service. 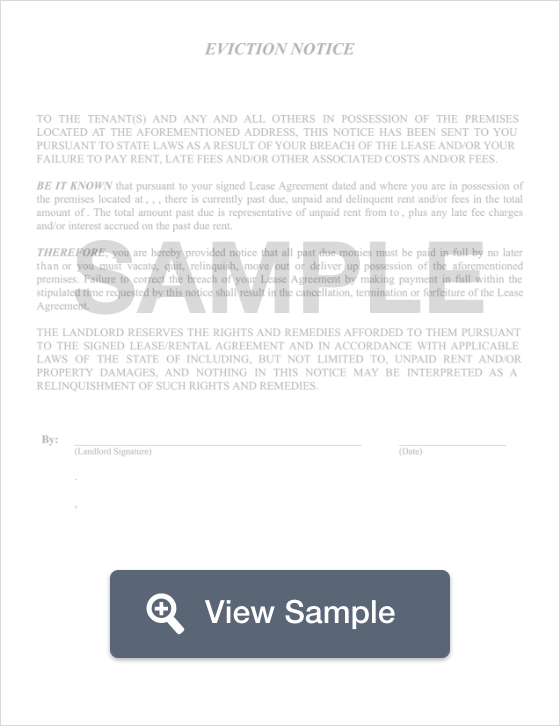 A landlord or the service agent could also use a signed acknowledgement if they serve the tenant in person. The tenant must refuse to comply with the notice before the landlord may file an eviction lawsuit against them. Under § 4467(a), an eviction notice for non-payment of rent provides the tenant with 14 days to pay the past due rent or vacate the property. The notice should include the amount of rent that is past due, the acceptable payment methods, and where the payment must be made. A 14-day notice to quit for illegal or harmful activity gives the landlord the right to evict the tenant off of the property for being engaged in an illegal act in or at the rental property. Under § 4467(2), the tenant has 14 days to vacate the property. It is helpful for the landlord to detail the illegal or harmful activity. That information can be obtained from a police report or court documents. A 30-day notice to quit for non-compliance is an eviction notice for curable lease or rental agreement violations. Under § 4467(b)(1), a tenant receives 30 days to comply with the lease or rental agreement or vacate the property. The landlord should explicitly mention how the lease or rental agreement was violated. This notice is not used for non-payment of rent. A 21-day notice to terminate a week-to-week tenancy isn’t necessarily issued because a tenant did something wrong. In fact, this notice can be used by a tenant or the landlord. The notice is used to inform the recipient that in 21 days, the property should be vacated. According to § 4467(c)(2), the person creating the notice should provide it either in person or via certified mail. A 60-day or 90-day notice to terminate a month-to-month tenancy is used to end a month-to-month lease agreement. Under § 4467(c)(1), a tenant of less than two years requires a 60 day notice. A tenant of more than two years requires a 90 day notice. Like the previous notice we discussed, this isn’t a traditional eviction notice and either party may create and deliver this notice either in person or through certified mail. What Are the Legal Considerations of a Vermont Eviction Notice? It’s important that Vermont eviction notices have the proper timeline attached to them. It is equally important that they are legally served. Landlords or their agents may not file an eviction lawsuit against the tenant unless the tenant refuses to comply with the notice before the term ends. If a landlord doesn’t receive an order from the court to do so, they may not change out the locks on the property or shut off the utilities. They also may not remove the tenant’s belongings. Those actions are illegal without the court order. Additionally, it is illegal for a landlord to evict a tenant because the tenant reported code violations or inhabitable conditions of the property to the housing authority. That sort of eviction is known as retaliatory eviction. Landlords have a legal obligation to provide safe and habitable housing. Landlords may not evict a tenant because of their actual or perceived family status, disability, gender, nationality, skin color, race, or religion. Doing so is a violation of The Fair Housing Act, a federal law. If a landlord uses an illegal eviction method, the tenant may have the legal right to file a lawsuit. If the tenant wins, they may receive financial compensation from the landlord. The landlord may also face fines for violating state or federal law. As a tenant, you have rights to safe and habitable housing. You also have rights during the eviction process. You can learn more about your rights by reading this website maintained by Vermont Law Help. If you receive an eviction notice, read it carefully to determine why it was issued, what you need to do, and the deadline by which you need to do it. Depending on why the eviction was issued, you may have the option to correct the violation or vacate the property. Read the section on this page that discusses legal considerations. It discusses illegal eviction methods. If you believe that you are the subject of an illegal eviction, you should make an appointment with a landlord-tenant attorney to discuss your potential options and to have your claim evaluated. You can also contact Vermont Law School and ask if they have an active legal clinic. Legal clinics provide affordable legal help in many situations. You can also contact Vermont Law Help. They have several free resources you can use. You may also apply and qualify for low-cost legal help. Landlords have rights and legal obligations. It’s important that landlords understand the entire eviction process. This includes not getting involved in illegal evictions as discussed earlier on this page. Landlords must legally serve the eviction notice and wait through the notice period to determine whether the tenant complies. If the tenant does not comply at that time, the landlord may then file a lawsuit for eviction. To learn more about the eviction process or the rights and obligations of landlords, make an appointment with a landlord-tenant attorney in the county where the rental property is located.